With CENSEO’s recent growth, our team has been focusing on the importance of working together effectively. After researching our options, we decided to make a trip over the Pali to Honolulu for a Wine & Design company outing. An evening of pupus and paint was exactly what we needed for company bonding and social time outside of the workplace. 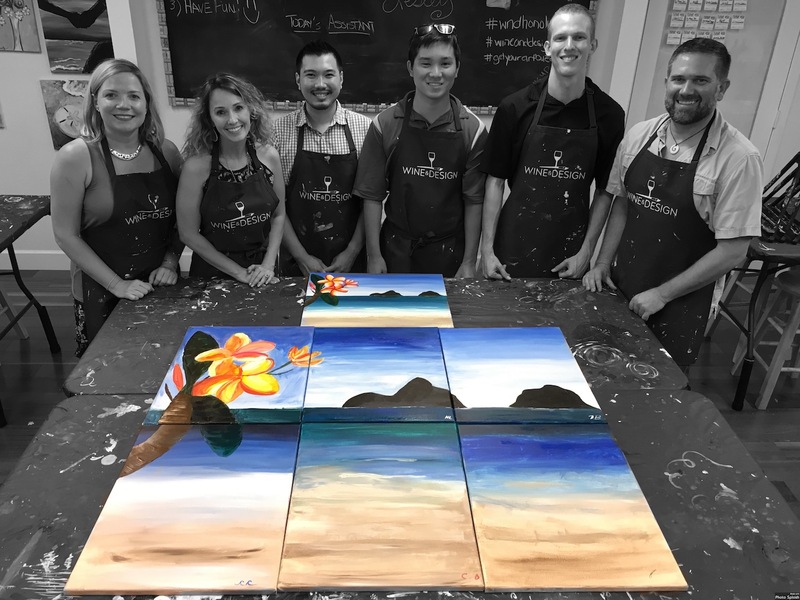 Wine & Design’s corporate painting party package is a bit different than the traditional paint night, which was a big part of the entertainment! Only one member of our team knew that our canvases would be placed together to make giant painting of the Mokes (because someone had to select our design). All other team members had only a piece of the puzzle to paint from. Some puzzle pieces were simple, while others were more complex with pieces of the islands or plumerias in the scene. It was mysterious and felt a little intimidating for those who were expecting a normal night of painting instruction. After painting our single canvases for only a few minutes, we were asked to stop and move to someone else’s easel. It felt strange, painting on someone else’s work, but after a few rotations we started to realize that the overall result was quite beneficial. The look and feel of each canvas was coming together. In the end, we lined up all six canvases on the table and corrected our mistakes. A couple of paintings (the more intricate ones) still needed finishing details, so we were able to choose our top talent to help out with the tricky parts. Our team agreed that this was probably the most enjoyable and educational team building activity we had participated in AND we now have a beautiful mural in our office space. I think we’re all pretty proud of our accomplishment! The icebreaker, or “artbreaker”, was our initial warm-up. We divided into two teams and drew secret assignments out of a jar. The jar was full of communication blockers and disabilities. Some of us could not talk or use our hands, others had to be bossy or defiant. It was tricky to understand some of the roles, such as the person doing exactly the opposite of what was directed. It led to some major difficulties in painting the assigned scene, and there wasn’t time for any one member to finish the painting on their own. Our teams did a decent job, considering, and laughing at the silly, out-of-character behaviors was most of the fun! Not knowing what the finished art was going to look like was a great mystery. It forced everyone to follow the guidelines for their own canvas closely. When our own canvas became someone else’s canvas too, it shed new light on the process. As we continued to work on others’ paintings, we realized the many techniques and skills that were coming together. The final product was impressive, and the time spent on finishing details pulled everything together. I think we were all impressed at how far we had come in just a short amount of time. The instructor explained the teamwork skills we were developing and made observations of our specific team’s ability to work together. Her hilarious sense of humor and wit assured that we were all laughing the entire time. Use code: CLARK at checkout! If you haven’t already created an account on denvertourclub.com, please do so when you redeem your first $20. Summer field trips start Monday, June 5th – check out the full summer schedule. Each spring we watch, with bittersweet endearment, as the piles of velvety powder slowly melt away from the slopes, and patches of green grass appear. What can make this changing of seasons a little sweeter? The Easter Bunny, of course…or, if you’re spending your days at Copper Mountain Resort, The Rainbow Fish Character! And he’s making quite the splash at Copper Mountain. Following breakfast: the World’s Largest Easter Egg Hunt!! Photo with a Rainbow Fish? Now this is Easter. Summit Sunrise Breakfast Buffet: fresh melons, pineapple, and seasonal berries. Assortment of fruit, yogurts, farm fresh scrambled eggs, Applewood smoked bacon & country style sausage links. Skillet style breakfast potatoes, waffle station, fruit preserves, and more! Photo opp with Rainbow Fish (don’t forget your cameras), coloring station and souvenir gift for each child. A limited number of tickets are available. Early ticket purchase is suggested. A weekend escape to Mile High Farms was the perfect fall family tradition activity, particularly with the lovely weather we’ve been so lucky to have this year. Mile High Farms is located east of Denver, which was a new adventure for our family. It was great to experience the scenery and countryside as we meandered out that way. The main draw for us: the corn maze! It took longer than we had hoped (because we’d like to skip right to expert), but hey, that’s all part of the fun, right? Being that this was our first visit to Mile High Family Farms, everything was new and exciting to us. Ambiance and props had been created with much creativity, and entertainment lurked around every corner. The western family farm appeal was impressively genuine. Wide open spaces offered plenty of romping room, and although everything was new to us, we made sure to check out the newest features to the farm. From the horse’s mouth…Mile High Farms is an excellent addition to the fall family fun bucket list! Summertime is anything but boring for our bunch (a nicer way of describing somewhat-organized chaos). Between the parties, BBQs, events, and gallivanting outdoors in the sunshiny days and cool nights, we have ordinary responsibilities. Bummer. And, while everyone faces the challenge of balancing fun and work, we have the additional challenge of navigating a schedule that’s rather out of the ordinary. Summer camp, drop-in style…saves the day! It’s the best solution I’ve found to manage our lives, which range from Colorado to Hawaii, 9 to 13 years, adventurous to super chillax; and we have to find a way to please everyone, of course (and I’m not claiming success to that one quite yet). Sam is the owner and main tour guide of the camp. He has experience working with children, a degree form CU, and is fully trained as a lifeguard – all of which helped me feel comfortable right away. 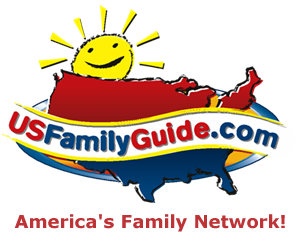 Sam combines education with adventure to create a fun atmosphere for the kids that parents can truly appreciate. This program is FREE on island! The program is sponsored by the North Shore Lifeguard Association and is taught by certified lifeguards. It’s intense and requires dedication, so it’s certainly not for everyone. My son, being more familiar with the Colorado scene, was certainly intimidated and will hopefully forgive his mom someday for strongly suggesting his involvement with the training (which could come in very handy someday!). I thought it would be a fabulous idea to introduce my youngest to her peer group culture on Oahu. The camp is very reasonably priced and full of local culture. Noelle had the opportunity to sing songs she had never heard of, talk about places that are a mystery to her, and she even mispronounced musubi – which left the other children in hysterics. Oh, and she’s still amazed that the kids hadn’t a clue what kickball was. This overnight adventure was included in the Kama’aina Kids daycamp package. We didn’t know this until attending camp (information can be increasingly difficult to obtain in Hawaii), but we were thrilled and Noelle had a North Shore adventure she’ll never forget! Beach fun, crabbing, low ropes, climbing wall, archery, camp fire time, and tie dye were just a few of the many experiences. When life demands mundane and necessary responsibilities, make drop-in summer camp your solution!